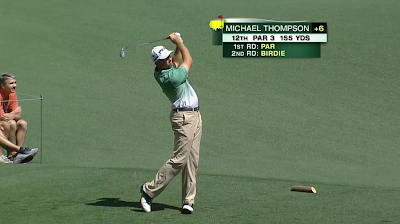 Michael Thompson had a tough day at the office. He had a rough go of it on the front nine, finishing that half of the course at 6 over par. Things got a little better with some birdies on the back 9 including a chip in "from the trees" on 17, but overall the round didn't go well. When the round finally came to an end, he was at +7 for the day. Despite not having the kind of round he would have hoped for, he sounded upbeat as usual when he tweeted a funny anecdote about his wife Rachel. @mslickthompson : "Quote of the day: @RVThompson2 to me: 'You putted like s**t today... but I still love you!' Hahahaha. She always makes me laugh! 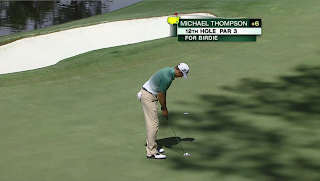 In support of Rachel's assessment, Michael had three 3-putts on Saturday. During the first two rounds, he had only had one. In addition to the putter being cold today, his irons were also a little off. Despite hitting 11 out of 14 fairways (his best round so far) he only hit 50% of the greens in regulation which was his lowest total for any of the first three rounds. Note that there's no Shot Tracker this week. 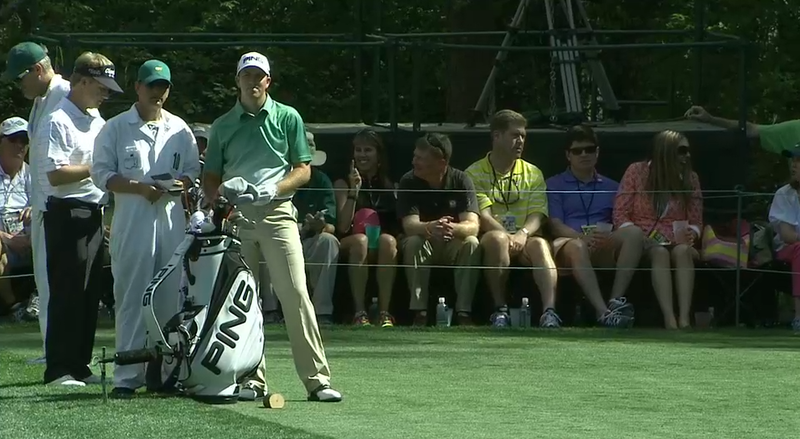 Masters.com will be streaming live video from various holes and even the driving range. The schedule is listed below. The Masters has their own iPhone app. One nice feature is that if you add a player to your favorites list, it will notify you when that player is playing the holes that are live-streamed online. Michael's tee shot on hole #12 would lead to his first birdie of round 3 at the Masters. Michael's birdie putt on hole #12 finds the bottom of the cup during the third round of the Masters. Michael takes his third shot on hole #15 from the greenside bunker during round 3 of the Masters. Michael and his caddie, Matt Bednarski, discuss the tee shot on hole #16 during the third round of the Masters. What's Up at the Masters Today?